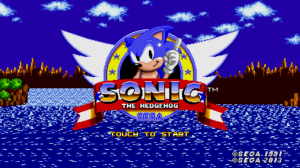 Less than a week ago, Sonic 1 received a Taxman/Stealth makeover for mobile platforms. The updated port has already cracked the Top 10 Paid Apps list in the US for both Google Play and the iOS App Store at #2 and #8, respectively. As we covered earlier, there are a ton of bonus features that more than warrant its $2.99 price tag. We encourage you to purchase the app, which you can find in the links below. After the jump you will also find some screenshots showcasing some of the bonus features (slight spoilers).